One of the best and exciting moments of pregnancy is finding out the baby's gender. There is nothing comparable to the wonder and awe of watching the little growing miracle on the ultrasound screen. And receiving the answer to the burning question...is it a girl...or a boy? Once your find out the baby's gender, the fun in sharing it with others begins! What better way to share the news than a party? 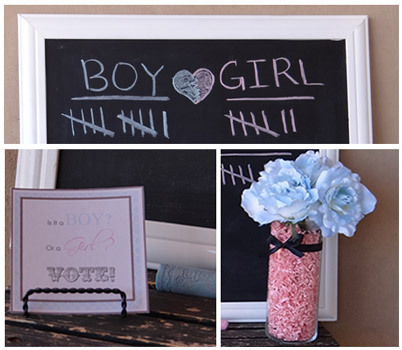 Gender reveal parties are a fun new trend among expecting couples. 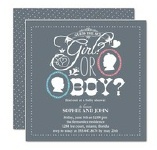 These parties are a great way to get together close family and friends to find out the baby's gender. 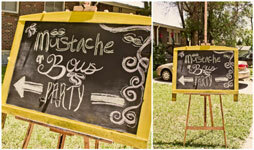 This type of party can be thrown with or without a baby shower. 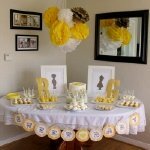 If it is thrown as a reveal party, it can be thrown as early as 18-20 weeks (the typical time frame of the ultrasound). If thrown as a baby shower, it is typically held a little later in the pregnancy, usually around the seventh or eighth month mark. Most parents choose not to find out the gender at all before the party. It makes it more special and exciting that way. ;) But there are parties I see here and there that the parents know the gender, (to help them with planning the party) but wait until the actual event to share the news with everyone. Waddle it be? Duck theme with yellow and white colors. What will it beee? 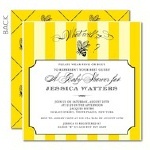 Bee theme yellow and black colors. Team pink or blue- Pink and blue accents. 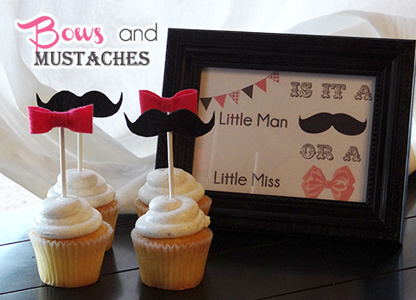 Little Man or Little Miss- Mustaches and bows. 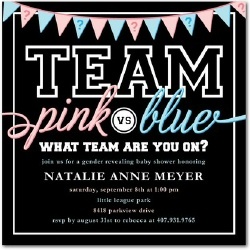 Team Pink or Blue: Guests come wearing pink or blue to match the gender of the baby and what they think it is. Take pictures of the teams of pink and blue. 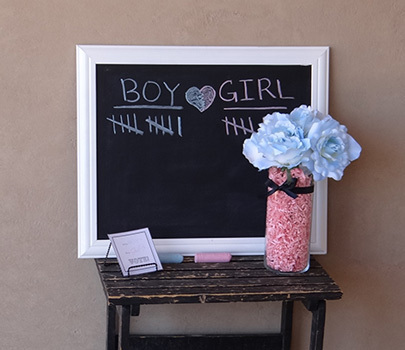 Keep a Chalkboard Scoreboard: Keep a tally of your guests and their guesses on the baby’s gender. Set up a fun chalkboard for them to mark their guess. Mustaches and Bows: Provide mustaches and bows on pins or clothespins for guests to wear to show their guess for the baby’s gender. Old Housewives Tales Predictions: Follow the old housewives tales quiz to predict the gender of the baby. It would be fun to see how close the prediction really is! Chinese Calendar: Look up the Chinese Calendar and see what gender it predicts the baby will be. 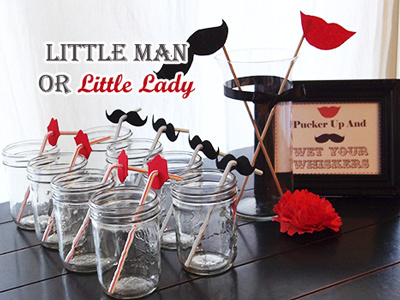 Photo Booth: Put together a fun photo booth with props to match your theme. Guests can take candid photos as a special treasured memory of the event. Baby Names: Allow your guests to write down their suggestions for baby names if it is a boy or if it is a girl. Cake or cupcakes: Deliver the envelope from the ultrasound to the person making the cake or cupcakes. Then they can either color the cake, frosting or filling inside pink or blue to match the results. When the cake is cut or the cupcake is bitten into, the gender will be revealed! Another idea is to bake a gumball into the cupcake that is blue or pink. Cake balls or cake pops: Bake a blue or pink tinted cake. Crumble the cake and mix with frosting. Create cake balls or cake pops out of mixture and cover it with a neutral chocolate color. When guests bite into it, the gender is revealed! Balloons: 1. Have the balloons filled with pink or blue confetti. Pop the balloons to find out the gender. 2. Have a person fill a box with pink or blue balloons to match the gender. When you open the box, it will release the balloons to announce the gender. Sugar Cookies: Decorate sugar cookies to match the theme of the party and wrap in cellophane with a cute thank you message. Favor Bag: Put together a bag filled with goodies as a thank you for your guests. Cupcakes or another treat: Cupcakes, cookies, oreo truffles or another small bite sized item can be a great favor to the party. 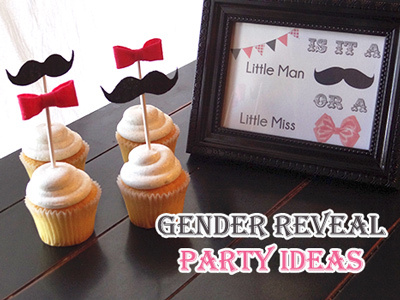 I hope this gives you some great ideas for putting together your gender reveal. Good Luck Planning The Party!